The Taiwan trip was full of beautiful encounters with exceptional people. 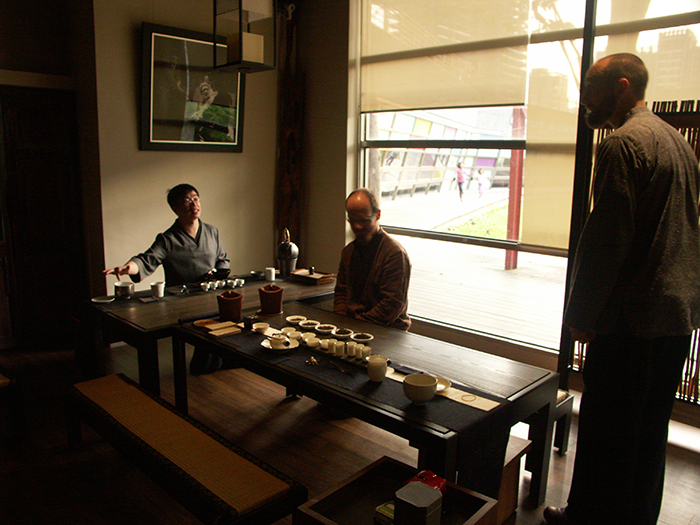 One of them was tea master Fang Lao Shi whom we met in a beautiful modern tearoom in the Museum of Modern Art in Taichung. With its 2.7 million of people, Taichung/Taizhong is a vibrant industrial megapolis and the third largest city in Taiwan. At the times of the greatest expansion of Taiwanese economy in the 1970s and 1980s the local factories would spew out millions of products labelled by the famous “Made in Taiwan”. It was the local Chou Shan Tang tearoom thanks to which the first Bubble Tea saw the light of the world in 1988, a tea product maybe more modern than many people actually wanted. Since then it has spread not only around Taiwan but also around the whole south-eastern Asia. Today we see it regularly in the streets of the Czech Republic and in shopping malls. 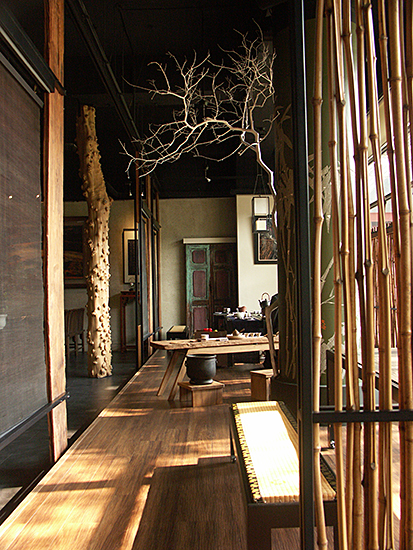 At the same time this very tearoom offers the selection of the best teas – its modern interior merges contemporary design and traditional Asian elements. 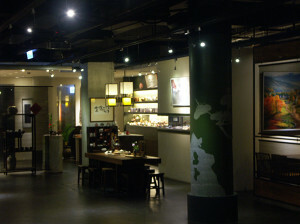 The same can be said about the offer of drinks and delicious vegetarian food. 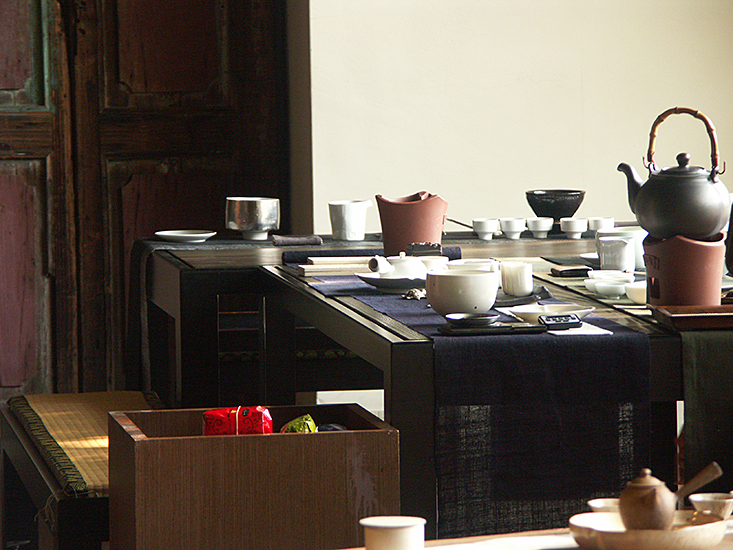 If you visit the tearoom on a regular day, the shop assistants will let you in the secret of the best teas of Taiwan. We were lucky enough to meet with respected tea master Fang Lao Shi himself. The meeting with the master was arranged by our friend Scott from California, his long-standing student with whom we went on to experience many adventures on our journey through Taiwan. 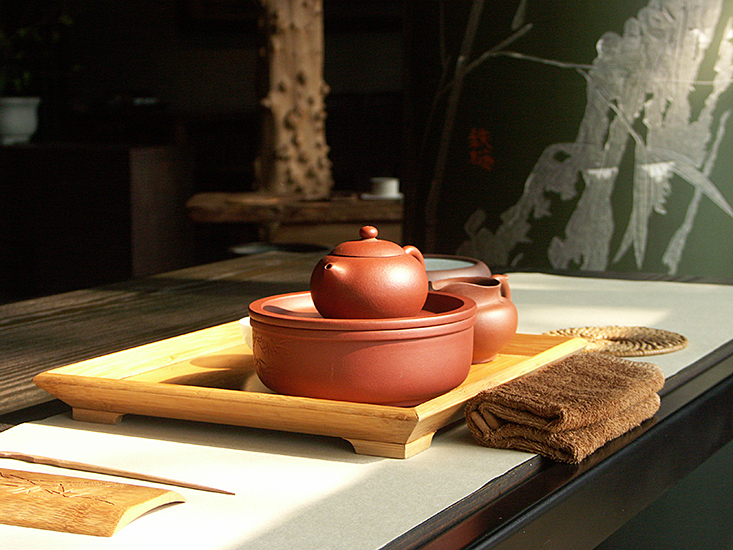 Fang Lao Shi greeted us with a masterfully arranged selection of teaware of different styles to show us various kinds of tea preparation. 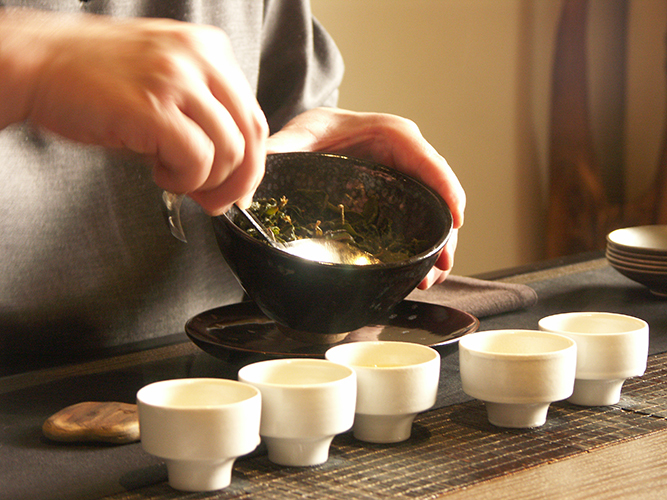 We infused tea directly in the bowls from which it was later drunk, the way farmers drink it during processing. 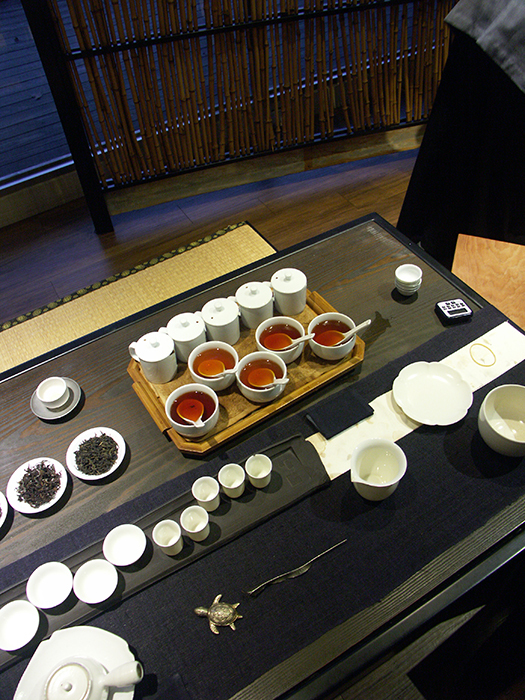 We had the chance to compare many kinds of Taiwanese red teas and we obtained a complex explanation of the whole history of tea growing in Taiwan, crossbreeding and the origin of all its famous cultivars. Fang Lao Shi as well as the whole tearoom team strongly admired Petr’s work and they expressed their respect for him – this occurred quite often during our journey. Afterwards we were in for a treat in the form of delicious vegetarian dinner; later we realised that we had spent several hours by the pleasant conversation. This was one of the nicest afternoons in Taiwan. Fang Lao-shi grew up in the country near Hsinchu, not far from Taipei. He later studied tea with his tea teacher for ten years until he began to teach tea on his own. He previously worked for a chain of tea rooms in Taiwan that eventually went out of business. 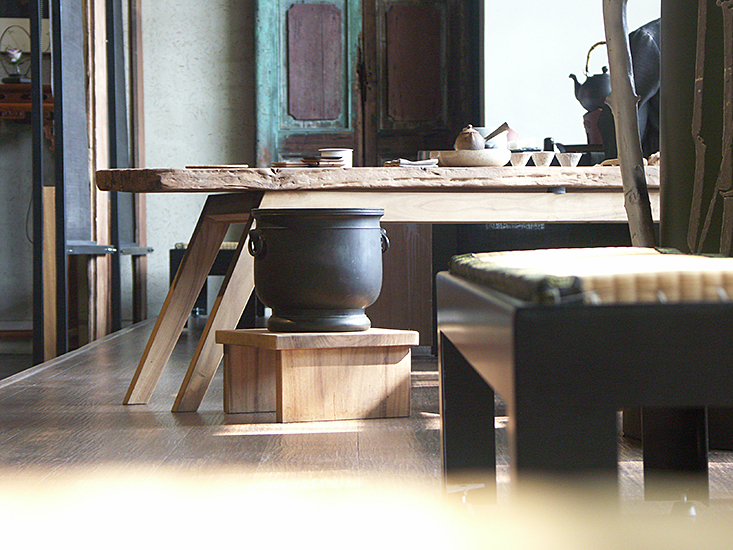 While working for that tea room the chef would often show up late for work or not show up at all and he learned how to make the tea cuisine that accompanies tea. Seeing this, his teacher sent him to work in a vegetarian restaurant in Taipei for a year to learn how to make completely (Buddhist) vegetarian cuisine. Somehow the owner of Chou Shan Tang and Qiu Shan Tang knew Fang Laoshi and invited him to work for Qiu Shan Tang after the previous chain of tea rooms went out of business. 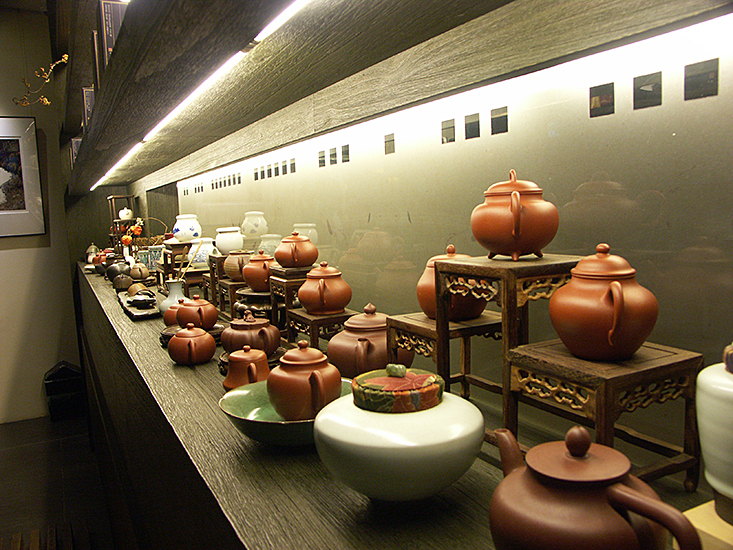 The Meishuguan museum in Taizhong approached Qiu Shan Tang and asked them if they would open a tea space below the museum because they believed it would be a good fit for what was taking place culturally at the site. Fang Laoshi, Meijun (the woman boss of Qiu Shan Tang) and Fang Laoshi previously worked together at the old tea room and both came to work for Qiu Shan Tang. 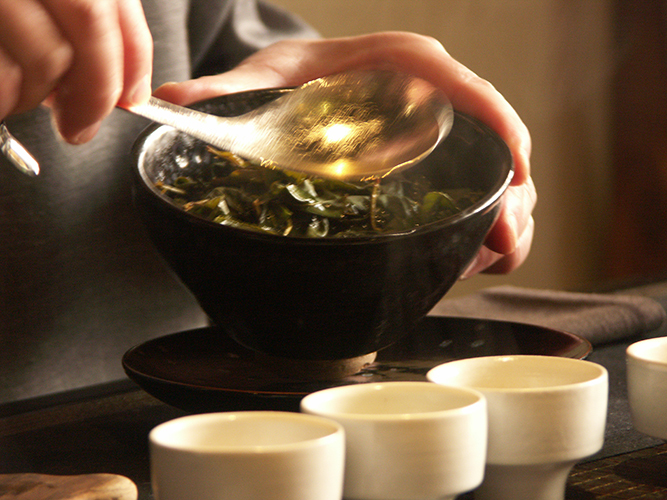 Fang Laoshi spent a number of years competing in chayi competitions for tea but no longer does so. 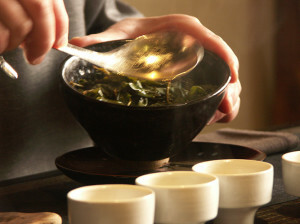 To him, “tea is the bridge” and he believes that the heart (xin/心) is the most important thing in tea. And while he is very specific as a teacher of tea; he is also very open and believes that every tea and every piece of teaware has a way that it can be used. His tea philosophy is very unique. 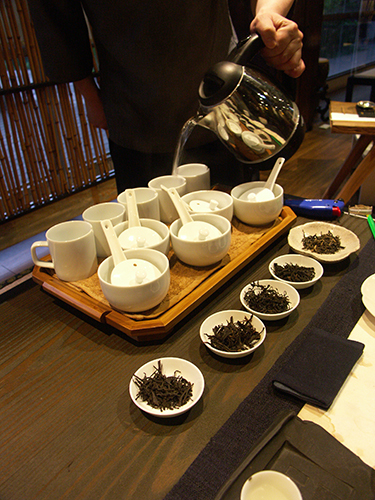 When pouring tea for a guest he will first pick the cups and believes the cups are the most important element, more or less, because the cups are the “bridge” between the tea made by the pourer and the tea drunk by the guest. He will create a chaxi (tea setting) based around the cups because they are the most intimate piece of teaware, being that they are brought to the mouth of the guest. Cups also greatly influence the mouthfeel and taste of tea. Many people put all their emphasis on the choice of brewing pot used. However, to Fang Laoshi, great effect can be had by changing the cups. 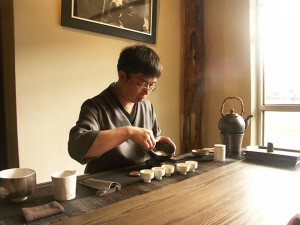 In my first lesson with him he brewed water in iron, clay, and steel teapots and then poured that water in various cups of different clays and glazes and tested me to see if I could tell the difference between the brewing devices and how the tea cups influenced the taste, huigan, and mouthfeel of the water. 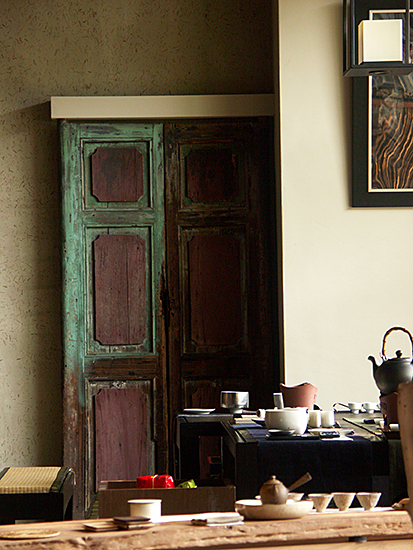 He has a house in Taipei but also rents a small room in Taizhong that he stays in during the work week. He travels to teach other classes besides the ones he teaches at Qiu Shan Tang when asked to do so. He teaches both men, women, and children. 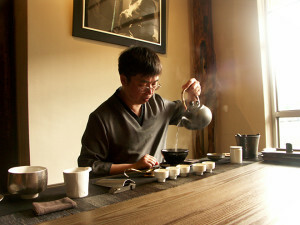 He prefers a modern (but artisanal and handmade) aesthetic and style in teaware and likes to have a diversity of textures and colors in his chaxi (tea setting). 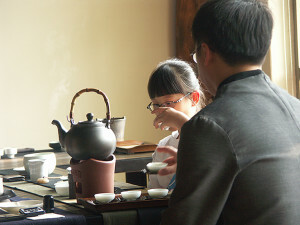 He seldom ever pours water over the teapot as the mainland Chinese do believing that this merely serves to lose heat from the pot through evaporation….if he is going to pour water over the pot it is typically in the earlier rounds. He is incredibly forgiving as a teacher and never hides his own “mistakes” and does not penalize students for their mistakes. 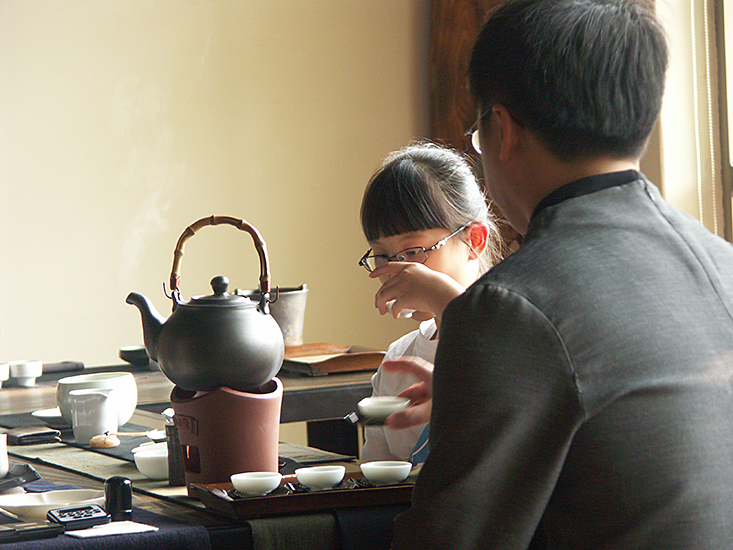 Traditional Chinese culture, due to the Confucian culture, often teaches in a severe manner. He does not believe in this way of teaching and prefers for people to learn from their mistakes. 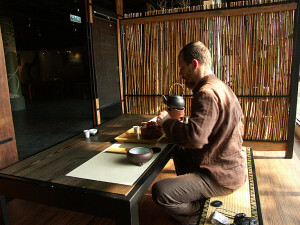 When studying with him he does not necessarily believe there is a right way to brew tea but he does believe each tea is capable of eliciting a certain profile of flavors, mouthfeel, etc. and he wants his students to be able to bring out all of the positive qualities in a given tea with each round. He is an incredibly sharing person. 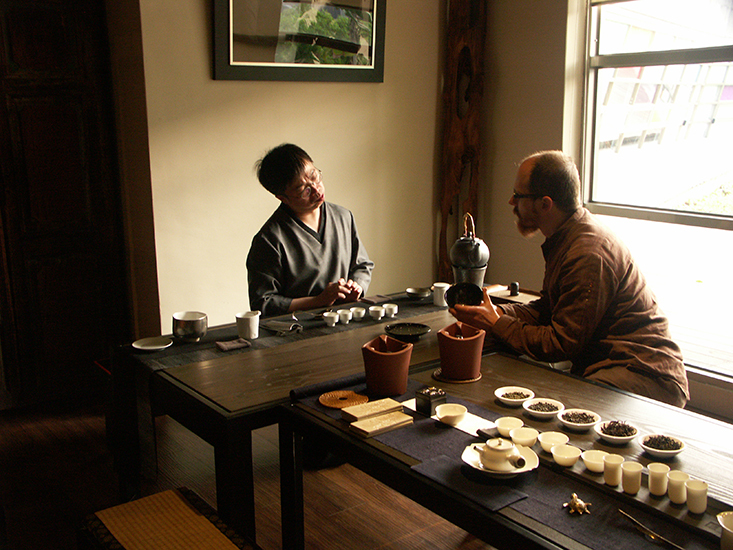 All of the teaware used in instructing his tea classes is his own personal teaware….much of it is Taiwanese artisanal teaware, some of it very expensive. 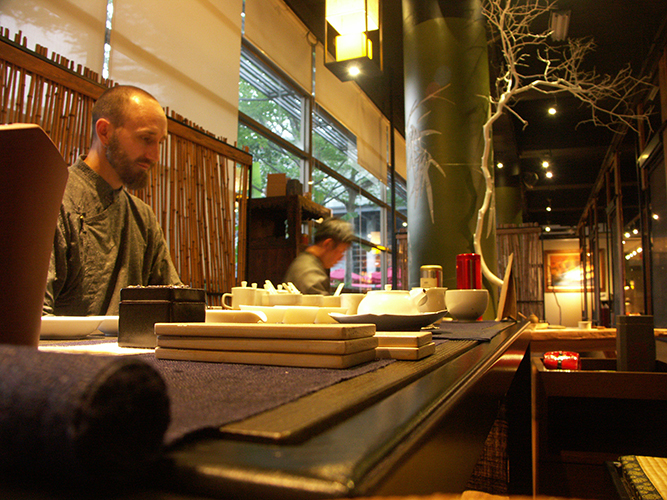 Still he shares all of his teaware with his students so that may learn from each piece. 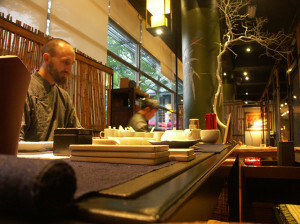 He typically teaches teapot, gaiwan/shib, and bowl style (as he served for us the night we met with him). He believes bowl style is the hardest and most difficult to pour well and that it shows a mastery of the subtle elements of tea. The last two weeks of my trip in Taiwan I spent 8-10 hours a day pouring and practicing bowl style with him at Qiu Shan Tang. He was always patient, tasted each of my rounds, gave me feedback, and brought me free food that he freshly made in the kitchen to accompany my tea. He never presents himself as “teacher” and tends to practice “alongside” of his students not “above” them. During his walks to work each day he walks through the park and likes to listen to nature for ideas with his tea and tea settings. In short, he is a humble, sincere, diligent, extremely open, very patient, father-like teacher whose whole life is tea; he often refers to Qiu Shan Tang as his home, especially since all of his teaware is there and he spends 12 hours a day there, even coming in on his days off sometimes. There is much more that can be said about him!